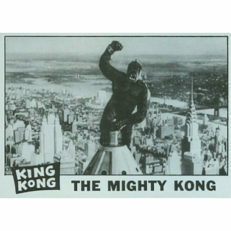 The 1965 Topps King Kong trading card set is one of the most rare non-sports sets in the hobby. How rare? It's possible that there are just dozens of complete sets worth of cards available and very few known complete sets. The series is technically a test run which was, ultimately, never nationally distributed. 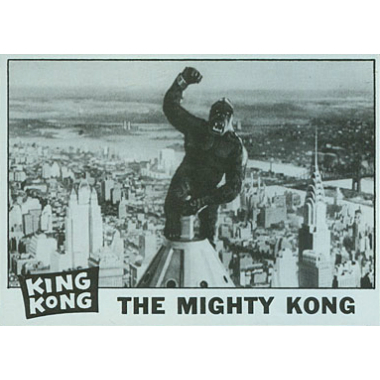 Each of the 55 cards are black and white stills from the 1933 film which were taken directly from a print of the movie delivered to Topps by rights holder R.K.O. General. 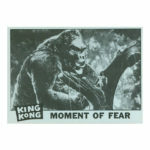 After the set was abandoned by Topps, they sold their images to Donruss - some of these images were used in a lower quality and widely distributed set that same year. The images are chronological with each card back telling the story of the film. The scarcity of this set may never be known. Between the incredibly short run, limited distribution geography, bad cuts, and age, these cards have become incredibly valuable among collectors. In 2016 a complete set of graded cards sold for more than $37,000 and individual cards rarely appear on eBay. Our checklist includes all of the cards in this set. Follow this hub using the button above and you will get automatic updates regarding this set when they become available via your "Following" page. 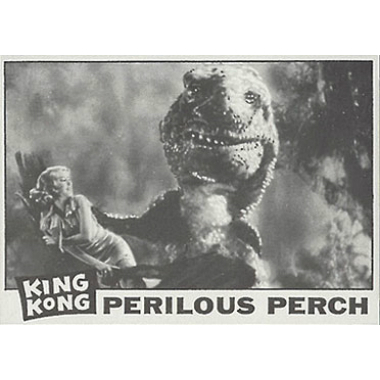 Topps Wrapper Art set 5 includes artwork from three classic trading card sets including King Kong, Cyndi Lauper, and the first Topps basketball series.